Every summer when I visit my parents in Portugal, I love to spend an afternoon strolling around the local gift stores. Fish is the predominant theme when it comes to Portuguese gifts, that’s probably because they eat more fish than anyone else in the world. That is where I got the inspiration for making a fish pillow. My fish pillow, of course, had to be made from repurposed fabrics. I used my 2 favourite fabrics for recycling denim and sweater felt. 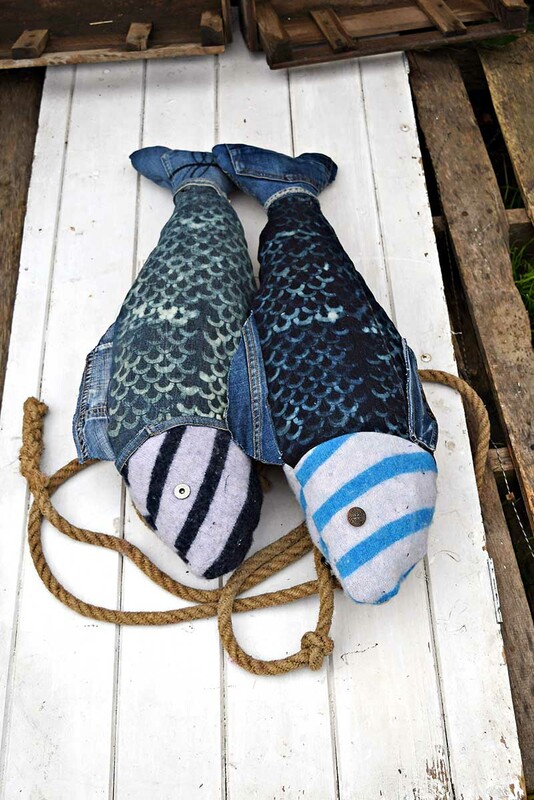 Using a pair of jeans for these fish pillows allowed me to use the interesting bits such as seams, buttons, and pockets to add details to the fish. 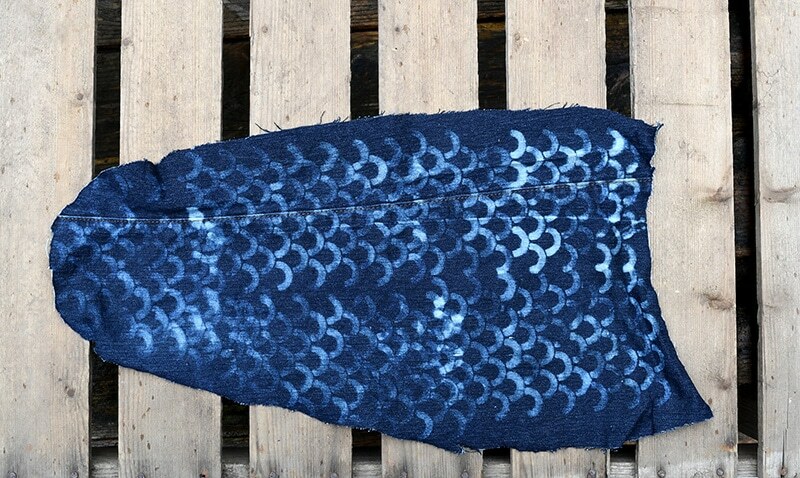 I was also able to bleach stencil fish scales onto the denim fabric. I’ve included the pattern I used for these denim pillows so that you can easily make them yourself. Combining denim with other fabrics to make interesting pillows is a popular upcycle of mine. In the past, I’ve combined denim with sari trim to make boho jeans pillows and I’ve made my son an iPhone denim pocket pillow. Paper pattern – Draw your own to the size you want or download mine here. 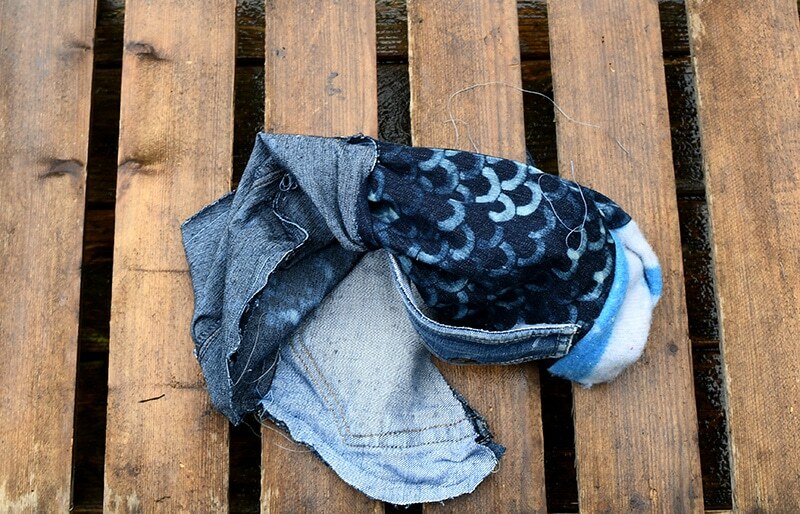 A pair of jeans or denim scraps from several pairs of jeans. Small piece of felted sweater fabric (see here how to felt sweaters), or other fabric. Fiberfill – I use old pillows for this. First, you will need to make a paper pattern template. 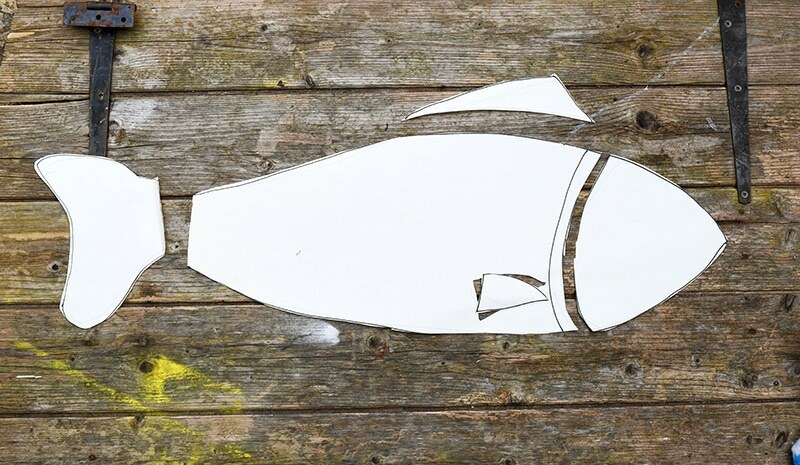 I drew my fish out onto paper and then cut it out into different sections, tail, head, body, and fin. I have scanned in the pattern I used which you can download and print out and use. Note the body template of the fish would not fit on one side of paper so it has been printed over two pages. Place the paper pattern onto the material and draw around allowing for a 1cm seam allowance. Then cut out the shape. Flip over the paper pattern and do the same again. As you will need 2 pieces of fabric for each body part. 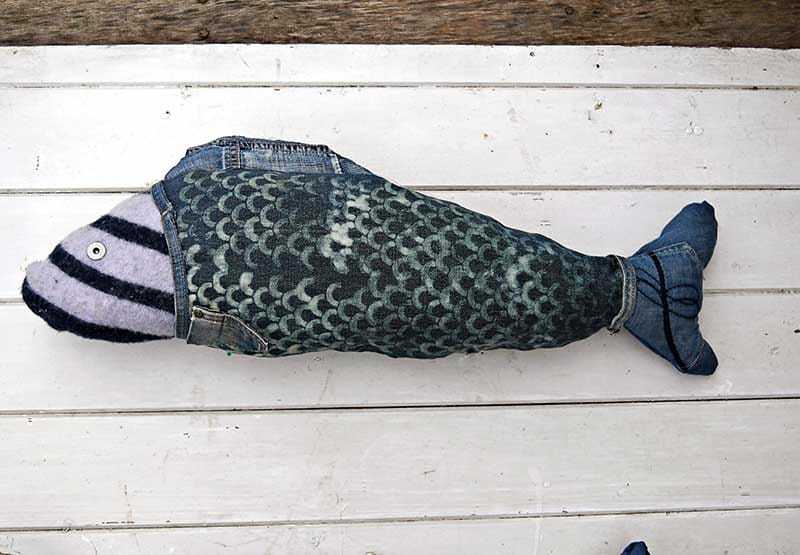 I used denim fabric for the body, tail and fins of the fish. For the head, I used the felted sweater fabric. 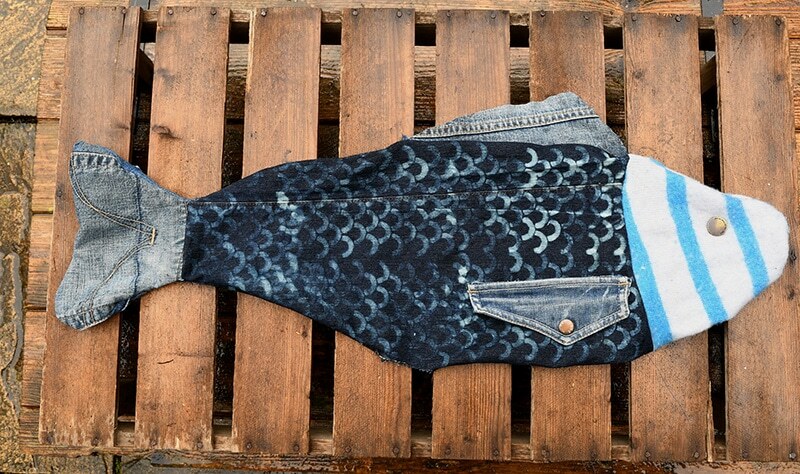 To make the bleached scales on the denim fabric..
Place the stencil onto the cut out denim body. Using a paint brush paint bleach onto the stencil. Leave for about 20mins to allow the bleach to work and then wash and dry the denim fabric. Next, layout the fish pieces for each side and then sew them together. This is also the time to sew any embelishments to the fish such as a fin on the body or an eye. I used the button from the jeans as the eye for the fish pillow. 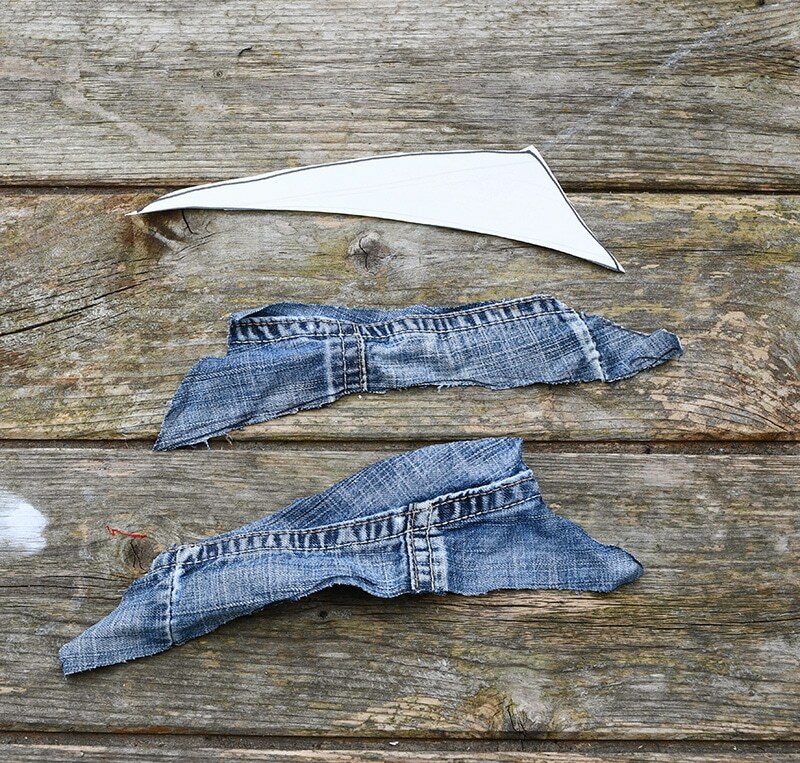 For the fin I just cut up a bit of the jeans pocket. Pin the two sides of the fish right sides together and sew. Leave an open gap of about 3 inches in the belly of the fish. Using the hole that you have left, turn the fish pillow right side out and stuff with fibre. Once you have finshed stuffing the pillow stitch up the hole. 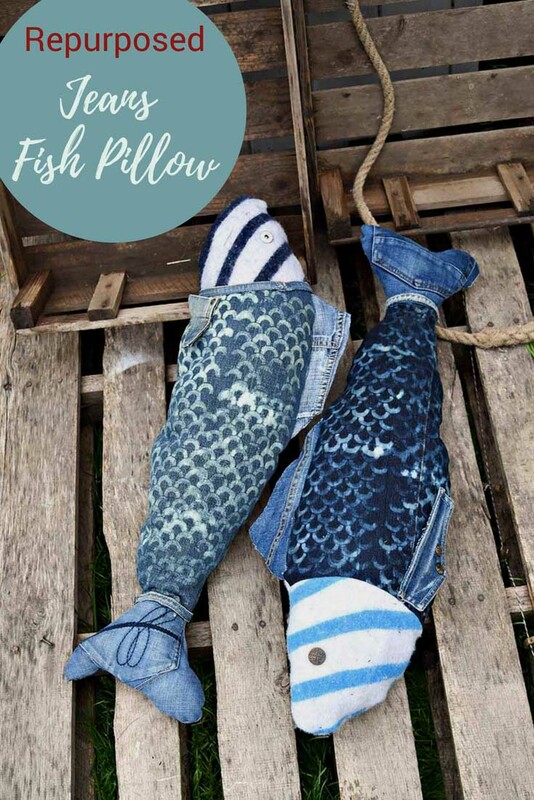 Finally you can leave your fish pillow as is or add further embilishements such as glueing denim seams to the body to add further detail. 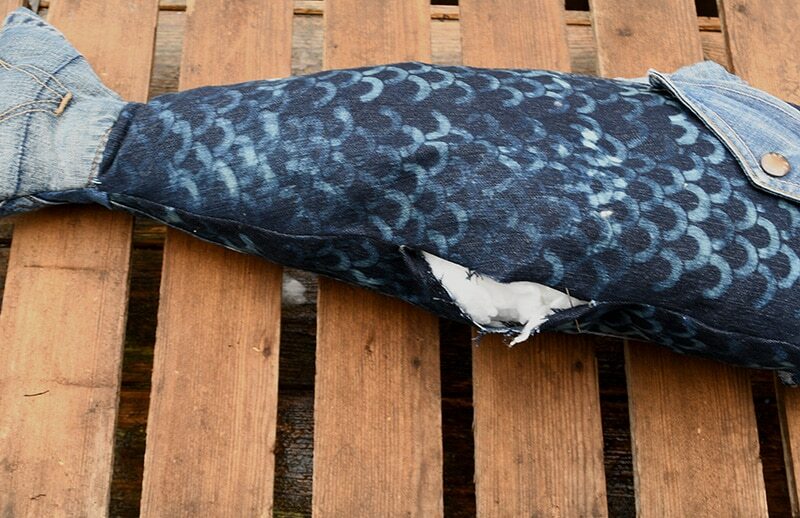 I loved the repurposed denim fish pillow so much that I made another one. I think the pillows look more interesting if you used denim from more than one pair of jeans that way you get lots of lovely shades of indigo. 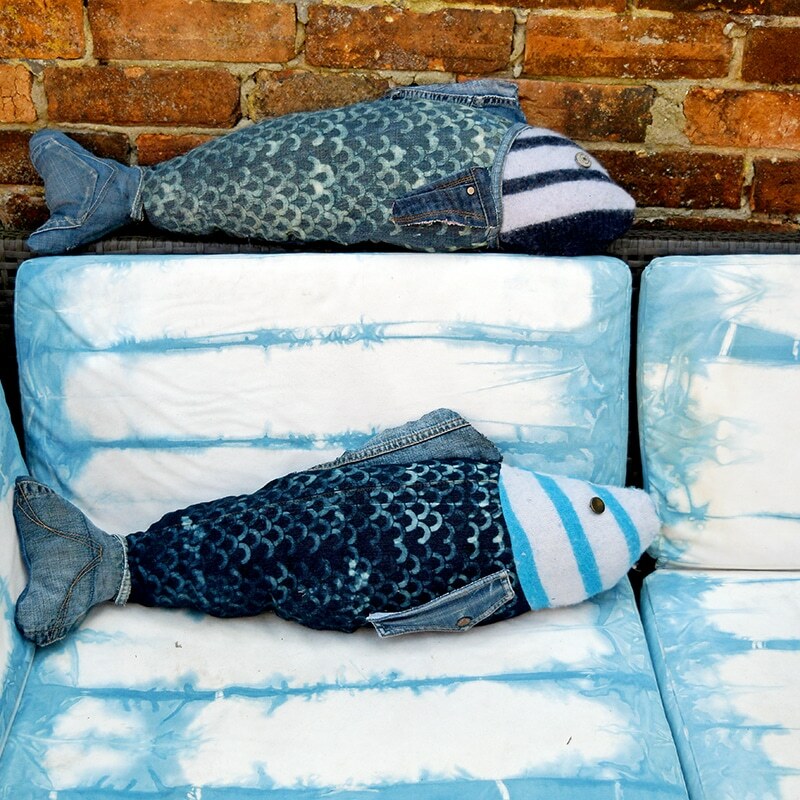 When placed outside on my sofa with shibori dyeing out side they look like the fish are swimming in the sea. 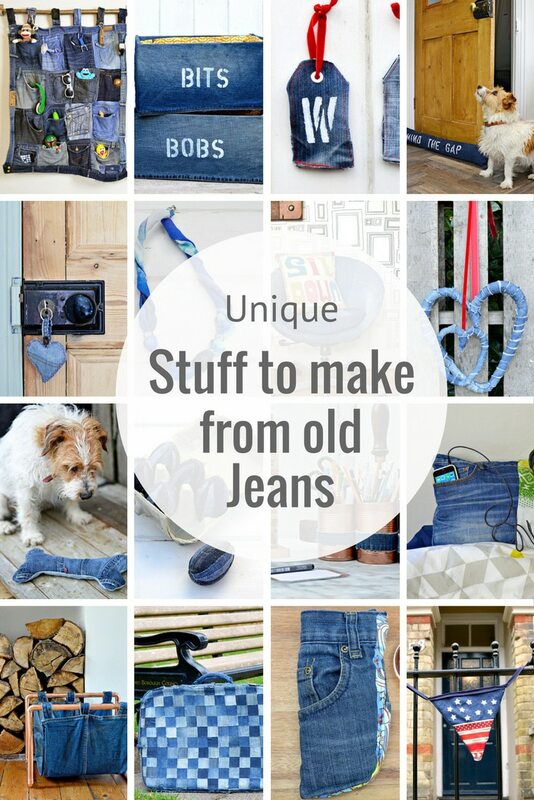 Don’t forget to check out my other denim crafts and DIY’s. Thank you so much. I hope you have fun making them. These are so cute, they make me want to go round up some denim odds and ends right now! Thanks for sharing with Party in Your PJs! Thank you. The denim bits make the pillows. Thank you, Lisa. 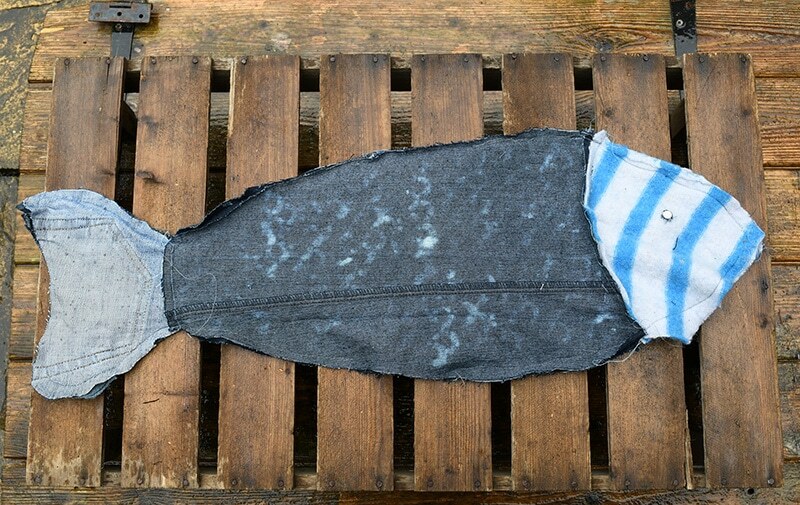 I love to use as many different parts of a pair of jeans in my denim upcycle projects as possible, I think it gives them character. Was amazed to see a project that I had missed thinking it was from last year, and now I see it was just from a few weeks ago, amazing! i’m so inspired by the idea of using the stencil to bleach the fabric, amazing. I’m adding this to the features of craft schooling Sunday, just can’t resist! What a fun idea and a great upcycle project. These are great for summer decor. 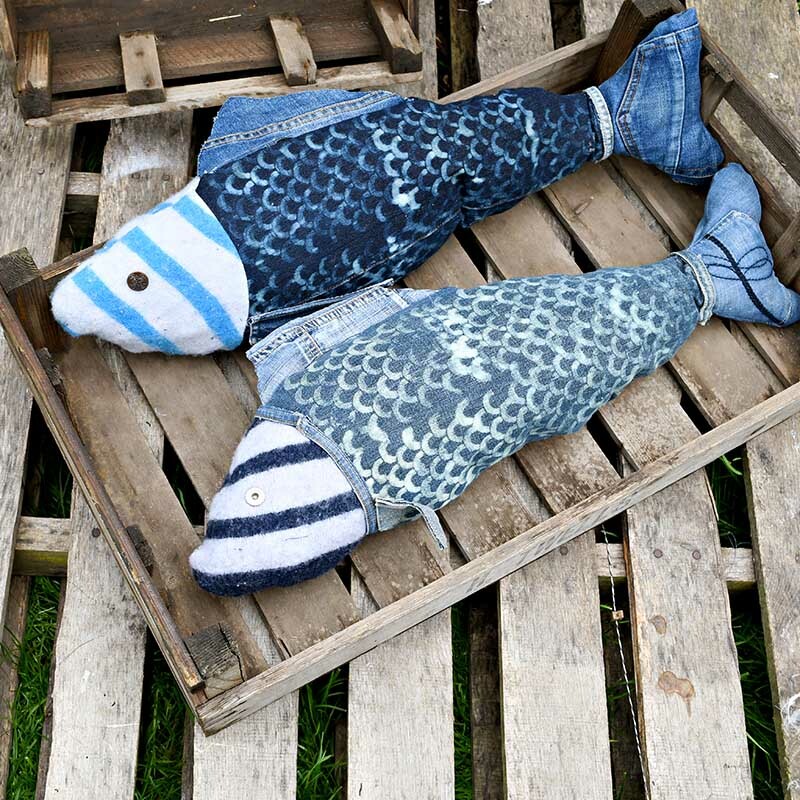 This was the most clicked from our last Snickerdoodle Party and all of the co-hosts will be featuring your repurposed denim fish pillows at today’s party. Hope you’ll join us! Thank you so much. That is lovely to hear, and yes I will be there. Thank you, I know what you mean about ugly fish! Claire you are the queen of denim. You can repurpose it into anything at all! Thank you, Mary. 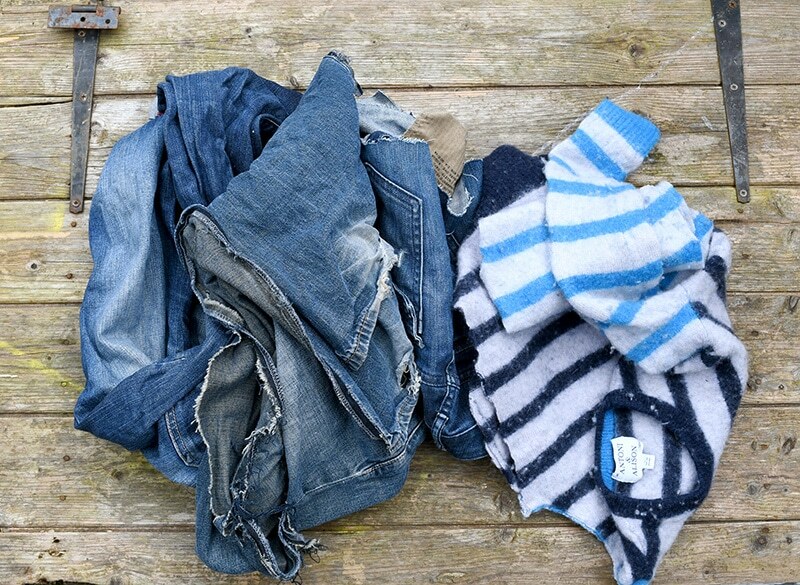 I still have a pile of old jeans calling out to be repurposed. these are so cute !! you are so creative! Thank you. Yes Portugal is very colourful, they do like their blue and white tiles. Very sunny too. These are great, and they do look brilliant on your lovely outside seating. I’ve seen quite a lot of fish decor items around, they are really fun. Thank you, Julie. They do look good outside especially with this lovely weather we are having. Ahh, thank you Michelle. 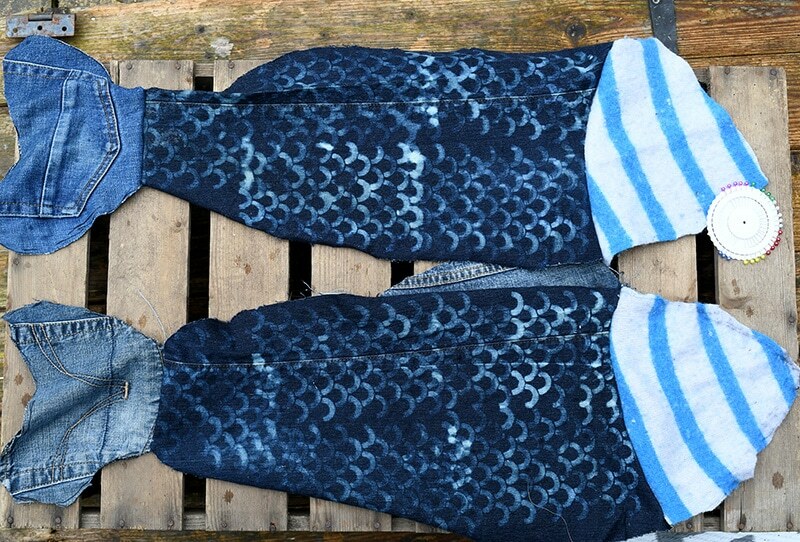 Still plenty more denim upcycles to come. 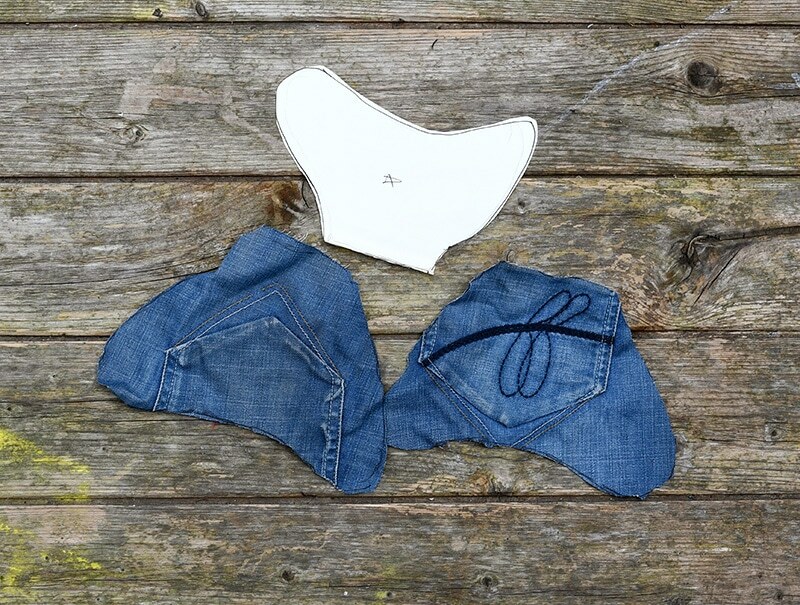 What a fun project, Claire, and a great way to utilise the hard to use bits of jeans. The scales totally make the fish pillows. Showcased today. Thank you so much Pam and thanks for the feature. These would be great at a beach or lake house. Thank you, they do have that summer holiday feel about them. Love these, I once made something similar with watercolor on cotton sheet material for Father’s day table display with vintage fishing gear. Thank you. That sounds like a really fun table scape. Great project as a gift for friends who have a lake home ~ thanks! Thank you Martha. Yes they would look great in a holiday home. Such a cute idea! 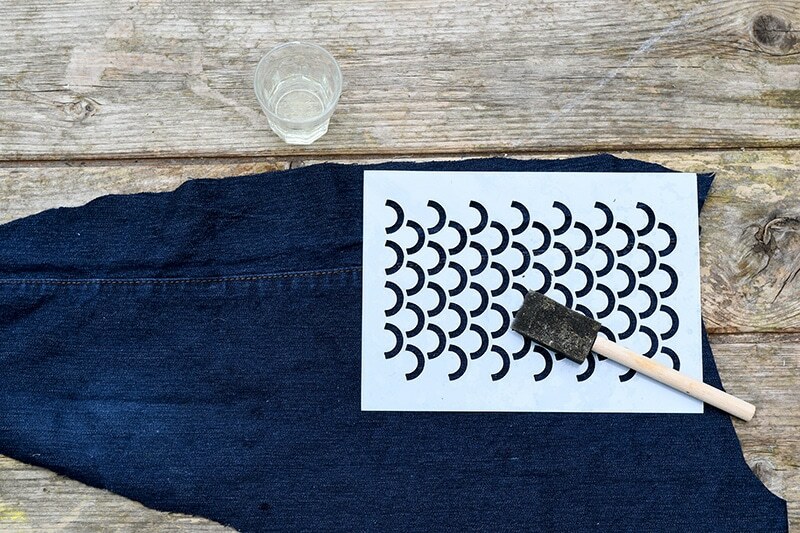 You could even just do some shibori reverse bleaching if you don’t have a stencil. I like that they can be hung by a rope when not in use. Thank you. I love shibori but haven’t tried the reverse I’ll have to check it out.